If you look at a map of London with Hammersmith to the west and the Isle of Dogs in the east and stick a pin in the middle, the chances are you’ll end up in Fitzrovia. Despite this convenient location it’s perfect for London’s Theatreland, Soho and the West End, and also offers easy access to the City-the area slipped off the radar after its 1920s Bohemian heyday. Fitzrovia was a name borrowed from the Fitzroy Tavern, where members of the Bloomsbury Group and other literati met to chew the fat. The area is roughly bordered by the Howard de Walden Estate to the west and Gower Street to the east. It straddles two boroughs-Camden and the City of Westminster-and two postcodes, which, for some, is the reason why its identity as a neighbourhood in its own right is sometimes lacklustre. 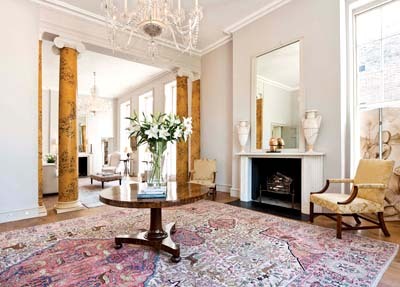 This week, Mr Taylor is launching what he believes is one of London’s most important houses to the market. Anyone who has read Ian McEwan’s Saturday will recognise the smart terrace houses of Fitzroy Square, with the BT Tower looming in the background, from the front cover. Along with restaurant critic Fay Maschler, Guy Ritchie, Griff Rhys Jones and Linda Bennett, owner of the shoe emporium LK Bennett, Mr McEwan has made the Georgian square his home. Grade I-listed No 33 forms part of the last project that Robert Adam took on before his death in 1792, long before the square was completed. The house stands in the west pavilion of the south terrace and has a distinctive façade, with the Ionic Order at first-floor level with two original Liardet roundels depicting Classical scenes.